A feature on social realist Proceso Gelladuga in the newspaper Manila Bulletin. There can be no doubt that Proceso Gelladuga II was destined to move people, through movement. In fact, one can say his destiny has been foreshadowed when he was christened Proceso, a distinguished name of Latin origin meaning, “He who moves forward.” Indeed, Pro, as he is known among his friends, did move forward, as well as in all other directions and toward new and exciting genres. Ever since he was a member of his college dance troupe in Negros Occidental, he had known that he was meant to be a full time dancer. His passion and discipline allowed him to refine his skills consistently, which led him to many opportunities that further solidified his name, both locally and abroad. He was intoxicated with the dynamic expressions that could be captured within deliberate, subtle, and elegant movements, hopelessly drawn to the emotions that passed in between two pulsating physical energies. In fact, this was how he met his wife, Nina, who has been his dance partner and collaborator since the first project they did together at Green Papaya in the early 2000s. “We know how each one moves. It’s so easy to make our ideas flow into our bodies,” he says. His deeply ingrained knowledge of movement inspired him to make the subjects of his paintings dance within the confines of his canvas. He also credits the dialogue and exchanges with his wife as an integral part of his conceptual development. His careful rendering gives his poignant monochromatic pieces, which are set off by bold red and blue hues, the gift of fluidity. 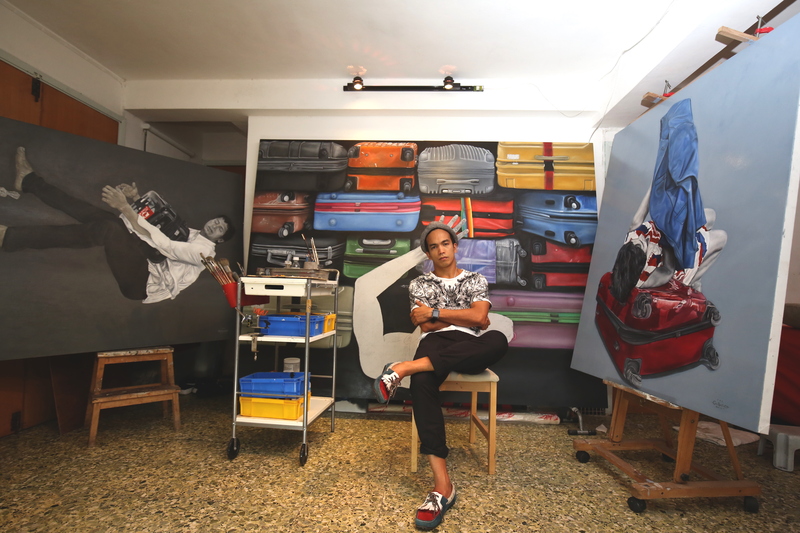 Maintaining his position as a dance instructor and choreographer, he is determined to paint as a full-time artist. Boxes and luggage are predominant images within his oeuvre and this is mostly a result of his reflections throughout his travels. With international projects bringing him to many countries throughout his prolific career as a dancer, he saw the harsh realities facing Overseas Filipino Workers (OFW). His experiences and encounters only reinforced his desire to portray and speak for his fellow Filipinos. 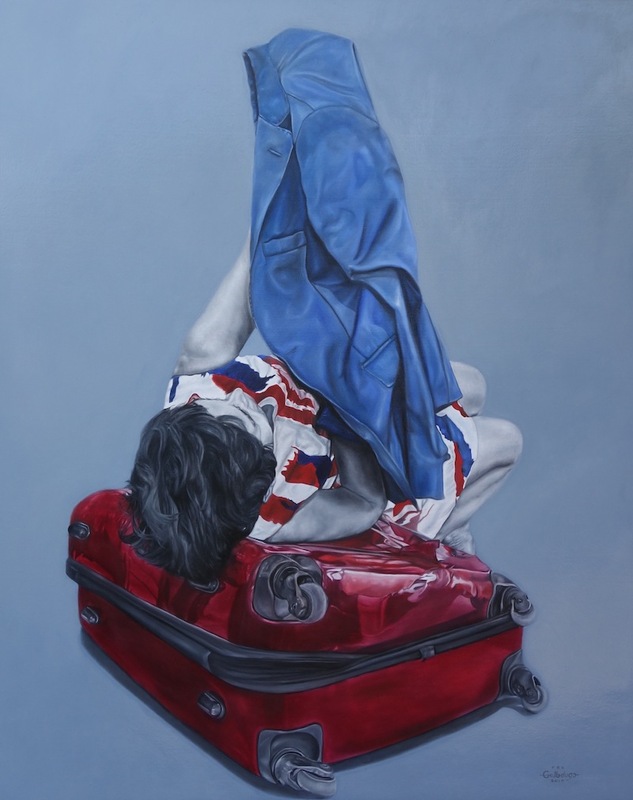 As he continued to delve into the issue of migration, which has always been a subject of interest, he began a dialogue through an artful and metaphorical depiction of the maleta, or luggage. 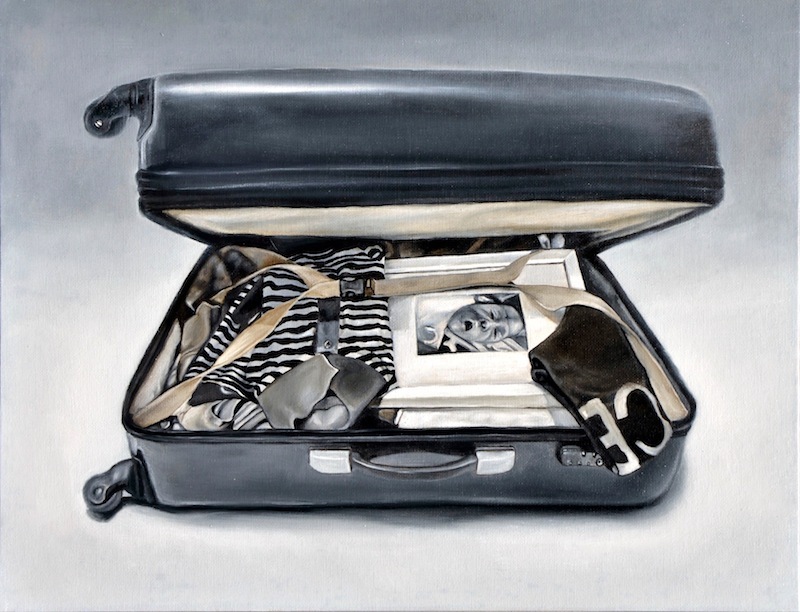 In his hands, the maleta is not merely an inanimate object, it is an extension of the owner, carrying its own distinct and intimate history and divulging the yearning for home and familiarity. In his latest exhibit, which serves as his 8th to date, Pro examines the hardships by capturing their hopes, dreams, and difficulties through mundane details and candid snapshots.